Eat Infographic: Why Does Bacon Smell So Good? Infographic: Why Does Bacon Smell So Good? 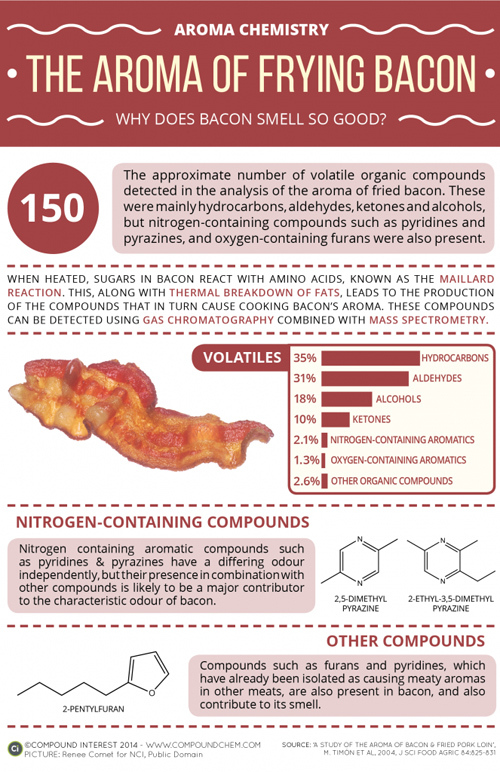 Here's a visual breakdown of the chemicals that make the aroma of sizzling bacon irresistible. If molecular gastronomy has taught us anything—aside from the fact that dinner is more fun when you can’t identify what’s on your plate—it’s that deliciousness can be boiled down to a series of chemical reactions. This clever infographic proves that fact by showing the various compounds that give bacon (a.k.a. carnivore’s crack) it’s irresistible smell. It turns out eau de bacon can’t be attributed to any particular chemical compound found in the rashers, it’s the magical combination of them that creates the happiest scent known to man—now also available in beard oil, air freshener, candles, and personal lubricant.